When my BBB Jivey said this week's topic was Reading Tricks and Treats, I knew I had the perfect idea to blog about! After reading a mentor text (I Need My Monster) this week, my students responded to their reading on these lunch bags! I just fed the lunch bags right into my printer-voila! A fun, new way to respond to reading! Funny thing....none of my students even asked why we were writing on lunch bags! (I'm not sure if that's good or bad!) One of my students last year said it best, "Expect the unexpected in Mrs. Miller's Class!" Great motto! After reading all of their responses, I filled those bags with some delicious popcorn! Responses can be thoughtful even on a lunch bag! LOL! Of course, it had to be a working snack! So, I "TRICK"ed them with their assignment, and then surprised them with a "TREAT"! Yay! Printing tips: Manually feed one bag at a time. Small piece of tape at the opening and on the bottom fold will help prevent paper jams. Hope you can use this idea in your classroom! 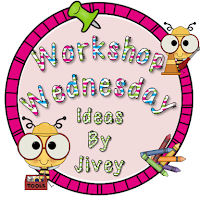 Be sure to check out all the other ideas at Ideas by Jivey! It's crazy to me how engaged students become once they get away from boring worksheets. I've never thought of having them write on lunch bags, but I'll have to try that idea. Thanks for sharing! I don't know which is more surprising...that you can feed lunch bags into the printer or that your students didn't realize they were writing on lunch bags! Lol! This is awesome! Such a fun idea! I'm not teaching reading this year, but I totally think I could adapt this for math or science! What a terrific idea! I teach first grade and I am thinking turn the bag over to make a puppet that goes with the story. This would work perfectly with Frog and Toad that we will be reading later this year. Thanks for the idea!!! This is a wonderful idea! I have never thought to print on a lunch bag. You are brilliant. Thanks for sharing a great way to may responding to reading fun! I would have never thought to run a lunch bag through a printer. You are a GENIUS!!!!!!!!!!!!!!!!!!!!!!!!!!!!!!!!!!!!! !